Urban conflagrations, such as the Great Chicago Fire of 1871 and the Great Boston Fire the following year, terrorized the citizens of nineteenth-century American cities. However, urban rebirth in the aftermath of great fires offered a chance to shape the future. Unfortunately, due to sales rights restrictions, we cannot offer Crucible Of Fire for sale in your country. Urban conflagrations, such as the Great Chicago Fire of 1871 and the Great Boston Fire the following year, terrorized the citizens of nineteenth-century American cities. However, urban rebirth in the aftermath of great fires offered a chance to shape the future. Ultimately residents and planners created sweeping changes in the methods of constructing buildings, planning city streets, engineering water distribution systems, underwriting fire insurance, and firefighting itself. Crucible of Fire describes how the practical knowledge gained from fighting nineteenth-century fires gave form and function to modern fire protection efforts. Changes in materials and building design resulted directly from tragedies such as fires in supposedly fireproof hotels. Thousands of buildings burned, millions of dollars were lost, the fire insurance industry faltered, and the nature of volunteerism changed radically before municipal authorities took the necessary actions. 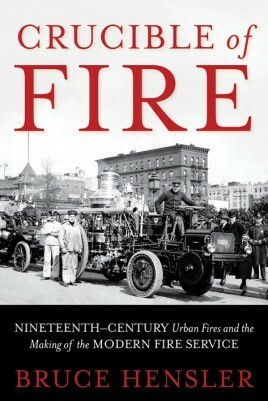 The great fires formed a crucible of learning for firefighters, engineers, architects, underwriters, and citizens. Veteran firefighter Bruce Hensler shows how the modern American fire service today is a direct result of the lessons of history and a rethinking of the efficacy of volunteerism in fighting fires. Crucible of Fire is an eye-opening look at today's fire service and a thorough examination of what firefighters, civic leaders, and ordinary citizens can do to protect their homes and communities from the mistakes of the past.